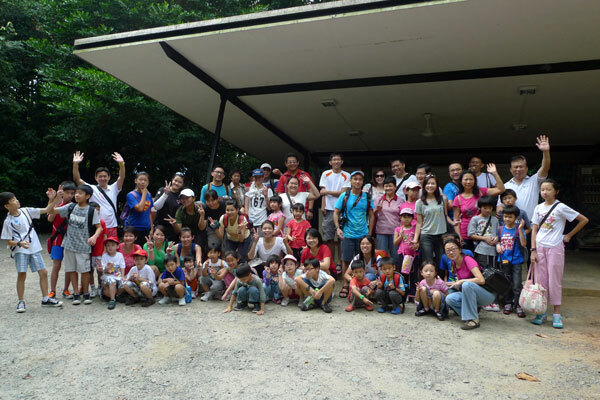 The Naked Hermit Crabs held our last guided walk at Chek Jawa for year 2012 today! There were a number of interesting sightings at Chek Jawa today. Upon arrival at the entrance of Chek Jawa, 3 wild boars came out of their foraging activities to meet us. One of them approached us real close and started sniffing around without any fear. 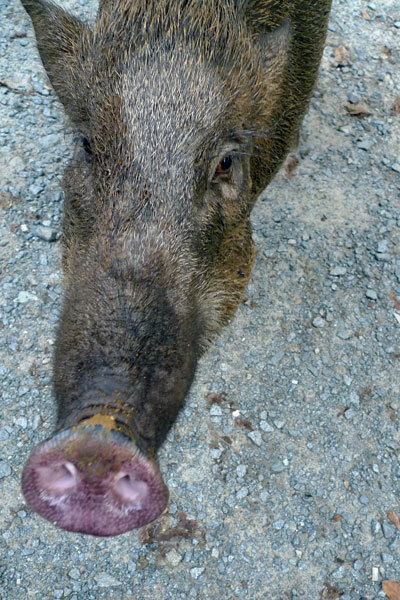 This can be disturbing as it could lead to unwanted accidents to members of the public if they were to start screaming and acting aggressive towards the wild boar. We (the guides) also had an opportunity to witness the wild boar grooming her child. Here's s video to the grooming. Soon after the call of the oriental pied-hornbill (Anthracoceros albirostris) diverted our attention away from the wild boar towards the calling sound. 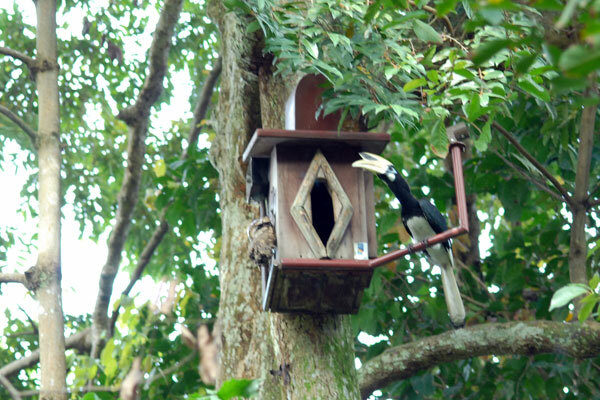 Turns out that there was a hornbill perched at one the highly visible man-made nesting box. It seems to be calling out to a female, trying to invite her to this nesting box. I hope that this nesting box will be sealed when the next guided walk happens. 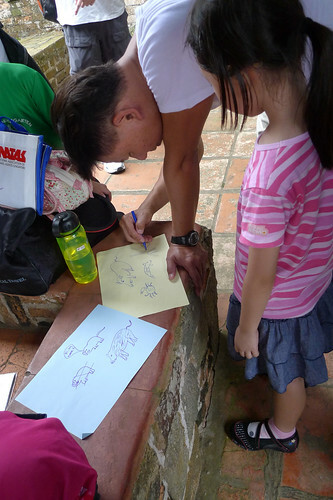 Despite only having 4 guiding groups today, everyone were all ready to bring our 70 over visitors around Chek Jawa. I guided a group of 16 family members, consisting of 3 generations from a grandmother, her children, in-laws and grandchildren. With an elderly in my group, I skipped the Jejawi tower. 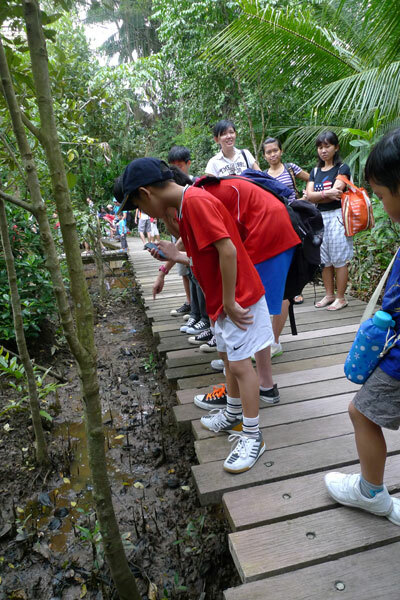 Being a nature guide, we have to work with the condition presented to us on the spot and make adjustments. We saw a lot of crabs today. In the mangrove, we saw a few big tree-climbing crabs (Episesarma sp.). It has been a very long time since I last saw a decent size tree-climbing crab. Usually, I see smaller sized ones. 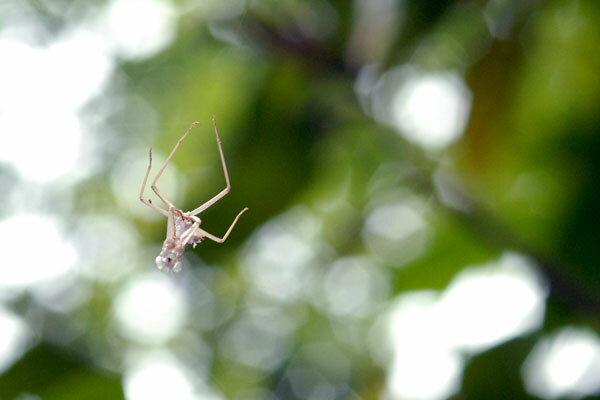 Towards the end of the mangrove section, one of my young visitor was commented on the numerous spider webs everywhere. 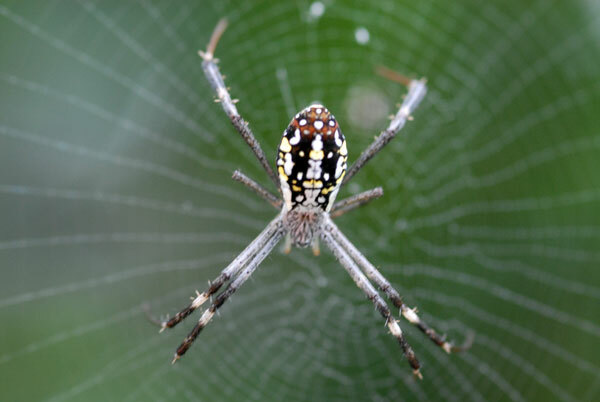 Coincidentally, we saw a mangrove St. Andrew's cross spider (Argiope mangal). It had two sets of zig zag lines on the lower part of the web. 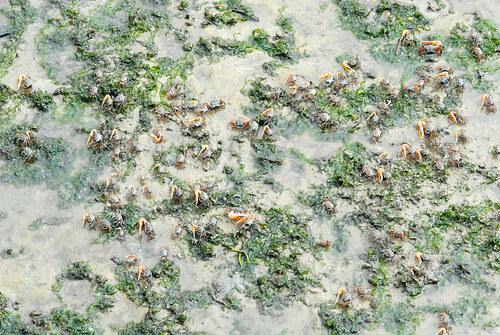 On the seagrass lagoon, the visitors and the guides observed an unusual behaviour of the fiddler crabs. They seemed to gathering themselves in very close manner, some in groups and some in lines. Those in lines had even stranger behaviour. 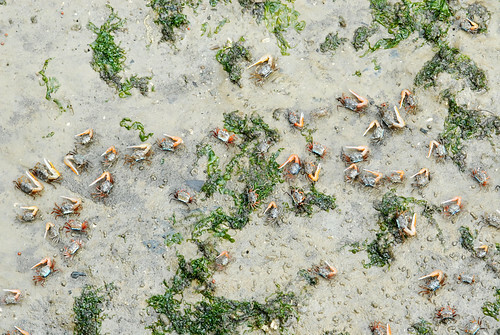 The male fiddler crabs were on the left while the female fiddler crabs were on the right of the line. 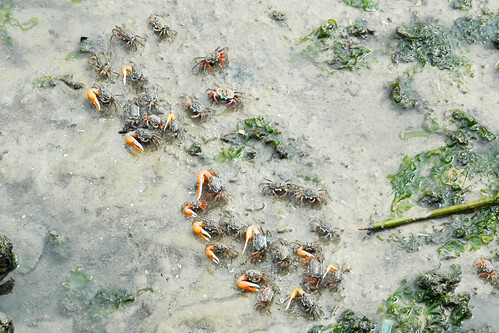 Here is a video of the fiddler crabs in their unusual gathering. I had some free time after the guided walk as my group had already called the van for the trip back to the village centre. I took a short walk down to take a look at the shortcut path. There was a dead praying mantis hanging from a tree. 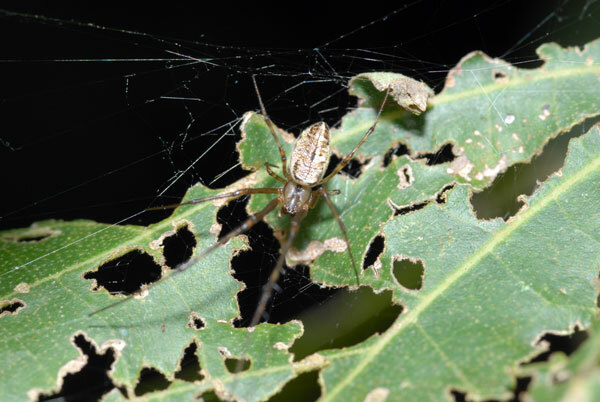 Tucked in a folded leave, a spider is hiding in there. I am not sure of its identity. 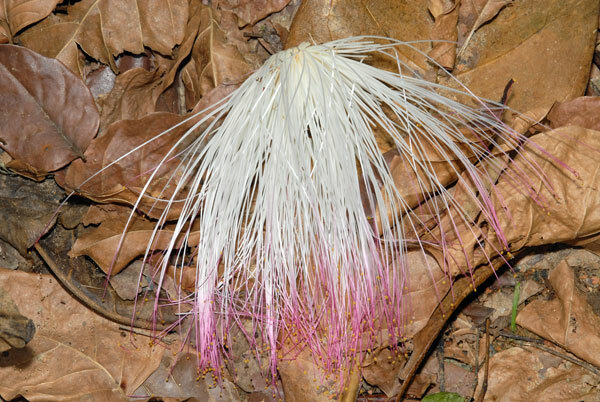 Further down on the path, the flowers of the sea poison tree (Barringtonia asiatica) have bloomed. Near the jejawi tower, I found another spider. I think it is the big-bellied tylorida (Tylorida ventralis). Nearby the spider, there was a pair of tiny beetles. And just after the start of the guided walk route, I found a snail shell. Back at House No. 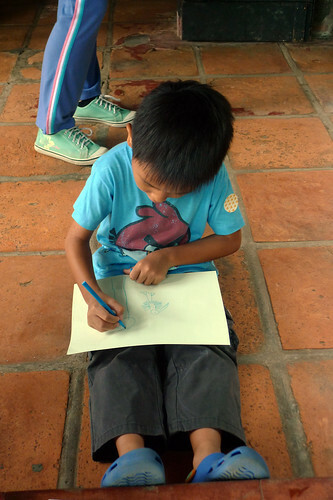 1, the children are already busy working on their entry for our guest book. We were blessed with good cloudy weather this morning. Worrying that the thunderstorm forecast in the late morning will affect the guided walk, the guides made some effort to finish the walk slightly earlier than usual. Lunch was as usual, at the sisters' restaurant with our standard dishes. Since there were fewer of the guides around today, we ordered less food. However the 2 black pepper crabs were too huge for us to finish everything. Ivan decided to takeaway the leftovers. 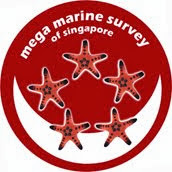 Thank you to LK, PY, Sankar and RT (Kok Sheng's student) for helping with the guiding today. 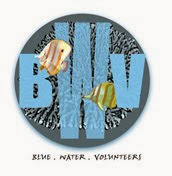 The rest of the regular guides were at the NParks' Volunteer Appreciation Day.